What should I say... as always your work is amazing and the port works perfectly, didnt encounter any bug in 45 minutes. Runs very smooth and I love it. Would like to donate some money but more than clicking the add is currently not possible, right? I really hope your project gets much more attention! There's a game breaking bug that slipped by the release. I'm fixing that right now. The download links will be up soon. If you're reading this and downloaded the game already, please redownload. When do you anticipate version 1.4 will be released? While for most people it probably looks better, I'd appreciate if there was a toogle for the older "blurred/soft" bicubic scaling method. There were also some minor music lag/quality issues in the main tunnel, noticeably during door transitions... but I have no idea what could be causing that. All I can say Is wow,I was so excited about finding a Metroid 2 remake online. U are brillant. 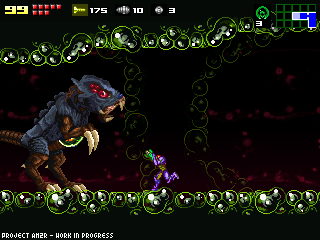 I`m play it right now and all I can say is .....This is Metroid 2. Love it. Not sure if its finished but I`ll find out while I play it. Great Job! Will there ever going to be a Mac release? Hot damn, this feels great. It feels like any minor problems/oddities were polished and refined to make this feel like a near perfect 2D Metroid experience. It's got the best of classic and "modern" 2D Metroid control options, and of course the newer ones that you came up with. I couldn't ever hope to do better myself. There's just one thing that's weirding me out. It'd be awesome if you could add in an option to make the jump button also unmorph you until you get the jump ball, like in Super Metroid. I never thought I'd find any feature from Super Metroid sticking with me, but here I am throwing myself off when the jump button doesn't unmorph me. It's funny. Anyway, you've outdone yourself Doc. You should be proud. This is amazing. I hope to God this project pulls through unlike most other remakes/stand alone Metroid games. Best of luck! Continue to appreciate your efforts on this. You're doing a mighty fine job and service to Metroid fans everywhere. Hey Doc. The performance increase in this update is phenomenal - no lag with a smooth 60 fps with vsync - I barely pulled 30 with previous versions! A small suggestion. The new intro in the music to Area 1 sounds excellent - very ambient with the bass line and drums building up - but when the song loops and the bass line and drums cut out and build up again, I feel I lose my rhythm and connection with the level. I propose you have a main loop with the drums and bass line at full volume, and only play the small intro section when the player first enters the area. I'm on WinXP and the game doesn't start. I double click the executable, but nothing happens. Hey Doc!, I recently downloaded this demo and i found that it is a bit incompatible with Windows XP,the game runs but it have a lot of bugs and errors, i took some screenshots from what happens so please if u can give me an e-mail i can show u what happens. I have tried multiple times to download the 1.34 demo, but every time it says an error occurred and it won't let me play. It isn't the download site because I tried multiple ones and it isn't my computer because I played the previous demos. Fix it soon please. Thanks. I loved Metroid: Zero Mission when I was younger and I absolutely love the work you guys are doing. Can't wait til it's finally finished! It should probably be re-titled when it's done though (hope this doesn't make it less likely to happen lol). Here's my humble suggestion "Metroid: Extermination"
< Thumbs up > can't wait for the other 25%. Keep up the good work with this project! I'm looking forward to playing the entire game when you're done! Works fine in Arch Linux (64-bit). Just make sure you have all the right 32-bit graphics libraries. 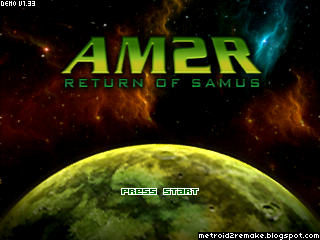 Whenever I try to open it, it keeps saying AM2R.exe has encountered an error and needs to close down. AMAZING game, I cannot express with words how delightful it is to me to experience this game in my own hands. Recomposed music feels so right, xbox 360 controls and rumble are so well thought and implemented, all the collisions are pixel-perfect, can't help but feel astonished to see such a high quality in a fan made remake. If it weren't because it would mean not being able to make it pc available nor in your website, I would even suggest showing it to Nintendo to make it a virtual console title. It truly deserves my most honest praise to you guys. So there is no mac port? This is very fine work. Makes an okay game pretty great. The biggest problem for me is that it's too easy. The original wasn't particularly difficult and with all the enhancements made here, I never came close to dying. I tried the "-software" thing but the game still didn't work? Could you fix this problem? Just finished this demo. AMAZING! The controls are so tight and intuitive! I am so sad that this is all that there is! I make art in my free time as well, so I completely understand that you can only get to this in your own time, but man do I ever hope you can finish this. The game is getting better and better with every update! Keep it up! One problem I had is with the joystick, i have a PS2 joystick thats compatible with PC via a USB cable, the thing is, the game does not detect it, is there any way to fix this? Thank you so much and congrats to the whole team for the amazing work! 1. WHEN IS 1.4 COMING OUT? 2. WHEN WILL THE WHOLE GAME BE COMPLETE? Maybe after this project is finished you can do a Super Metroid Remake. And Maybe Red Monkey and Lava Hand will do a Sequel to Super Metroid Phazon. Just think about how good the Sequel will look on your engine. This game is absolutely brilliant I'm hooked, can't wait to play the full game. Will this game be available for Mac? this is very good, i´m Always up to this form of metroid remake, i grow up with metroid zero mission, my age, 17 now,i live in the Nederlands, now, i have one question for you, i see screen shots you have set online, but i haven´t found it yet in the game, so when is the next update coming? Hey! Anyone who wants to play AM2R on a mac, it works perfectly in Wine, for those of you who don't know what that is its a Mac and Linux program that allows those OS's to run .exe files, just google Wine for Mac and you should find it. I beat the Game Under 2 Hours. PLEASE MAKE MORE! That Experience was Epic. So the game is brilliant. I do not care about the bugs so much, but I really wanna complete the full game.Because the Demo just ended to an exciting part.And the game is awesome the graphics,the enemies,the bosses and all items.They have work so hard on this game and even the items are the same places as in original Metroid 2.But there are some problems and their are that the game is too easy and you cant play the game on Hard.I hope they will fix that and they make a Full Version and Demo longer. This is absolutely amazing! Excellent work and big pats on the back to everyone involved! I can't wait to play a final version, but this demo was incredible all the same. I've played many hacks and fan remakes and this one is up there at the top for sure. Keep up the good work! keep up the good work on making this, I enjoy each update of this that is released and based on from the 1.24 update I'm assuming your close to finishing the game? The 2-D Gameboy versions have been my absolute favorite thus far. I'm really happy and excited to see another Metroid series fan out there! :D Keep it up buddy! Hello, my son plays your game and he loves it. Thank you so much for all of your hard work. (1) A gamma metroid just appears in area 3 at Metroid breeding grounds, you don't see it and then it just suddenly appears. Hey, Excelent work for this Project i ended up the demo 1.34, only 14 metroids left, thank you for bringing this game, we need more, take your time and prepare the last parts of the game! the game can't launch for me. I am using windows xp, although most of the problem could be that my computer isn't powerful enough, since it can't play most pc games. Wow man this looks incredible! Question, what are you using to program the game? Like did you create your own engine? Played through on Hard mode as far as it's implemented. Looks excellent, feels great. Great work. Your game is awesome I hope you keep at it and finish it, the only concern in my 20 min gameplay was that I would really like to play this game on HD if possible but anyway it´s looks great! Please release a Mac version! hey not sure if its just me just a simple bug, whenever i try to pause during a door transition and unpause they game refuses to load the next room or run any sprite animations. i can still pause and fiddle with the pause/map and items but samus is locked midstride and the room is black. other than that, thank you for making this remake. it is such a relief to actually be able to play metroid 2 on a newer engine. it is incredibly addicting and the soundtrack is everything a metroid game deserves. What if you have a Mac? I mean I really want to play this game, but... I don't see any download links for Macs? Can somebody please help me. LOVE THIS GAME! I played the original on Virtual Console from 3DS and got up to the screw attack but then got lost trying to find 1 metroid. This version eliminates the guessing of where to go to get somewhere and gives us a map (With Markers! Love those things!) and a logbook to store all the data and stuff. Beat the demo with 77% items within a day of getting it downloaded! Can't WAIT for this to be finished! Who many areas do you plan on having cause this demo is pretty big and Im only half way through. When I point the gun diagonally and directly upwards, the missiles won't fire. Is this a glitch? Thank you this is amazing. I don't normally play 2D games, even Super Metroid is unplayable to me today, but this plays great. Hey, I have a webhosting project for Fan Remakes, may its interessting for you too? Your work seems to be perfct for this. A version for Mac OS... Any chance? I have a question. Is there a way to clear button assignments? Love the demo, by the way.